‘We need to go out and have coffee,’ Senhor R said sternly one morning. I sighed. ‘Fine!’ I said ‘Let’s go!”. Oh wait, that’s right. I like coffee. But when someone tells me to do something, I straight away want to do the opposite. Not to mention that these last couple of weekends have been like mini coffee tours as we try to drink and photograph as many coffees as possible, preferably on a Saturday. This is because I started falling behind. I got a bit busy, I got a bit lazy. I got a job. I graduated. It was my birthday. These are all good things, but let’s face it, they don’t leave much time for coffee dates. I really need to get my priorities straight. When Senhor R and I sit down in a cafe, every single time without fail, they give me his coffee and they give him mine. This happens whether the same person who took our order brings us the coffees or not, whether I order or Senhor R orders or whether we both order. 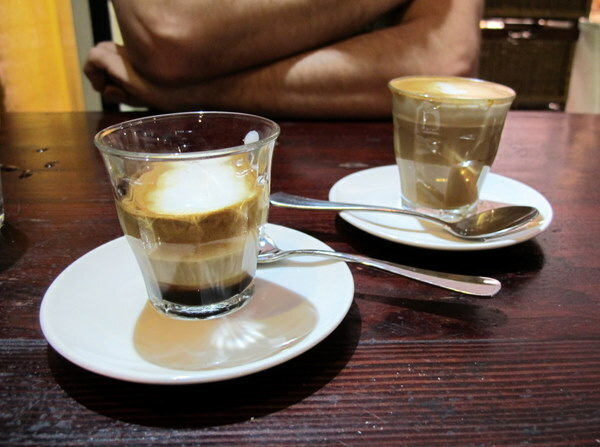 Apparently a piccolo latte is a ladies’ drink, while a macchiato is super-machismo. Ah, well. I don’t mind wearing the metaphorical pants for a while. Crave espresso is a place I’d been meaning to revisit for a while, and Senhor R kept suggesting it. So naturally, like any good girlfriend, I put it at the bottom of my list. After all, it’s not far from home and we could go there anytime. And I do wear the pants. 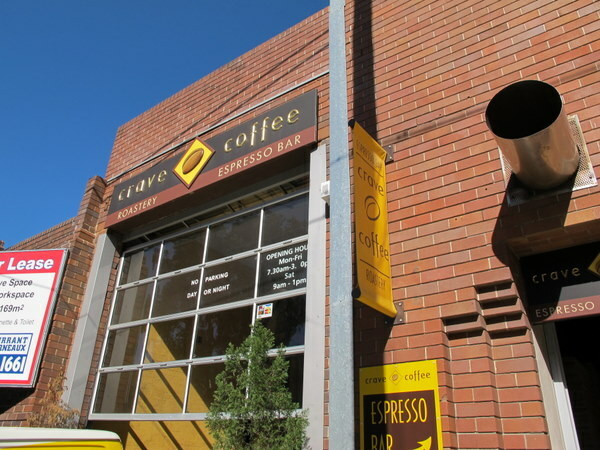 The cafe part of Crave espresso is located above their warehouse in Alexandria. It’s one of those you’ve-gotta-know-where-to-look places but they do pretty good trade from the surrounding apartments. When we arrived on a Saturday morning they were relatively full, but it soon cleared out. We ordered our usuals, swapped coffees and sipped. Impressive flavour, more so than I remembered. In fact, we liked it so much that Senhor R got them to grind us a 250g bag of whatever we were drinking to take away. I know, I know. I should’ve been taking notes. But frankly I was too caffeinated to care what I was drinking. I was too busy enjoying it. I recommend checking out crave espresso if you get a chance. The owners are friendly, the coffee is solid and you can take some home if you’re that way inclined. And don’t do what I do when someone tells me to do something. Don’t do the opposite. I “discovered” this place when a clueless cab driver took us the wrong way and went down this street. And here you are blogging about it already. I swear you’ve got your finger on the pulse! Sounds like a Happy birthday and congrats on graduating and getting a job is in order! Hip hip hooray! It’s true, I’m seriously considering changing my coffee order just to appease wait-staff and appease that nagging guilt that says real men don’t drink piccolos. Have to say I really enjoy the flavour of Crave coffee – even the take away shop near my work that stocks Crave and looks like it shouldn’t make good coffee produces better results than some of the more prestige brands about the place. @ John – Why thank you sir! Where coffee is concerned, I don’t want to miss a single opportunity.